Some legislators noticed what was happening. 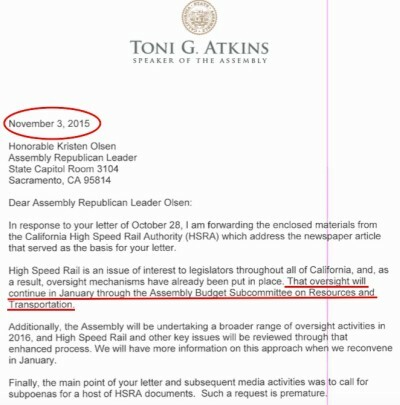 On November 14, 2017, Assemblymember Jim Patterson of Fresno asked the Joint Legislative Audit Committee for an urgent audit of the California High-Speed Rail Authority. 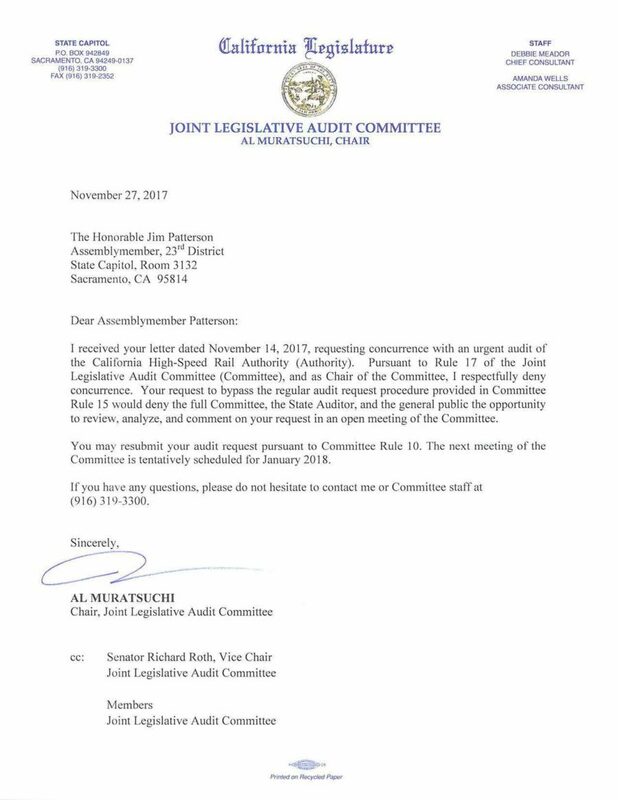 The chair of the committee rejected the request on November 27, 2017: Joint Legislative Audit Committee Denies Patterson Request for Urgent California High School Rail Authority Audit. During the past four weeks, the California State Legislature has discussed the 2016 Draft Business Plan for California High-Speed Rail in several hearings. While some legislators continue to effusively praise the project, many legislators – both Republicans and Democrats – have expressed grave concerns about the abrupt change in the direction of the project and the outlook for funding sources. On March 28, 2016, the California Legislative Analyst’s Office released a report entitled Review of High-Speed Rail Draft 2016 Business Plan. This report stirred the Assembly Transportation Committee enough to pass Assembly Bill 2847 on a 15-0 vote on April 18. Introduced by Assemblymember Jim Patterson (a critic of the project), AB 2847 requires the California High-Speed Rail Authority to do two things in future business plans: (1) include projected financing costs for a proposed segment or combination of segments, and (2) identify any significant changes in scope for segments identified in the previous business plan or project update report, and provide an explanation of adjustments in cost and schedule attributable to those changes. In a letter to the committee, Citizens for High-Speed Rail Accountability urged lawmakers to reconsider all funding for bullet trains. “There is not enough money available to put a functional financially sound high-speed train on what they are building,” the group wrote. Nevertheless, the project moves on, with an Assembly budget hearing scheduled for April 20 to discuss the $500 million annual budget appropriation of cap-and-trade tax revenue to the California High-Speed Rail Authority. On March 28, the California State Assembly held an oversight hearing to review the Draft 2016 Business Plan for the California High-Speed Rail Authority. On April 4, the California State Senate held an oversight hearing on California High-Speed Rail: An Overview of the 2016 Draft Business Plan. On April 6, the Assembly Budget Subcommittee #3 Resources and Transportation held a hearing on California High-Speed Rail. As expected, the alleged “oversight” of the validity of the California High-Speed Rail Authority’s estimates of project costs and schedule was inadequate and deceptive. Citizens and state legislators concerned about the project were given minimal opportunity to challenge the “high levels of confidence” that California High-Speed Rail Authority officials claimed to have about the project. No one from Citizens for California High-Speed Rail Accountability (CCHSRA) or any other organization critical of the project was invited to be a panelist, of course. Invited panelists were Dan Richard, Chairman of the California High-Speed Rail Authority Board of Directors, Jeff Morales, Chief Executive Officer of the California High-Speed Rail Authority, and Louis Thompson, Chairman of the California High-Speed Rail Peer Review Group. Similar to past oversight committee meetings, the chairperson of the committee (Assemblyman Richard Bloom) limited the time of the hearing to 90 minutes and the allotted time given to public comment to one minute. Assemblyman Jay Obernolte (R-Hesperia) asked questions. After questioning various claims about the project and receiving empty answers, Assemblyman Jim Patterson (R-Fresno) futilely requested the committee chairman to allow additional time for discussion of the most expensive construction project in human history. A chief focus of the hearing was rebutting an October 24, 2015 Los Angeles Times article ($68-Billion California Bullet Train Project Likely to Overshoot Budget and Deadline Targets). It was also emphasized that the California High-Speed Rail Authority would soon issue a new 2016 Business Plan that would essentially make the past irrelevant. A few professional lobbyists defended the California High-Speed Rail Authority during public comment. Prominent among them was a representative of the California Labor Federation and a representative of the State Building and Construction Trades Council of California, who praised the agency’s transparency and eagerness for oversight. Get ready for the California High-Speed Rail Authority board meeting in Fresno on May 6 and 7, 2014 for public comment and a vote on the Final Environmental Impact Report/Environmental Impact Statement (FEIR/FEIS) for the Fresno to Bakersfield Project Segment of the California High-Speed Train Program. This report is required under the California Environmental Quality Act (CEQA) and federal National Environmental Protection Act (NEPA). 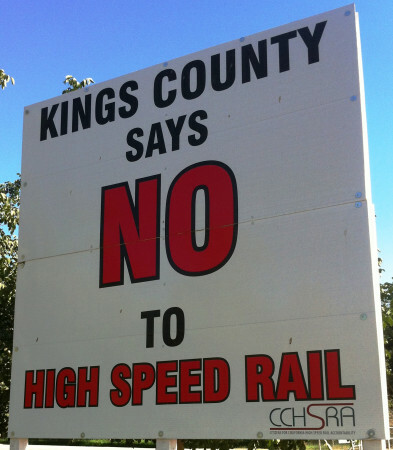 Citizens for California High-Speed Rail Accountability (CCHSRA) sent a letter dated April 23, 2014 to the California High-Speed Rail Authority asking the agency to delay a May 7, 2014 scheduled vote of the board on the Fresno to Bakersfield Project Segment. CCHSRA argued that 17 days was too short of a time for interested parties to review and analyze the Authority’s 4,800 pages of responses. As reported in the article “Bullet Train Opponents Want More Time to Review EIR” in the April 28, 2014 Central Valley Business Times, Assemblyman Jim Patterson (R-Fresno) and State Senator Andy Vidak (R-Hanford) also requested the Authority to delay the vote. On Monday, March 24, the California Assembly Transportation Committee held a hearing on Assembly Bill 1501, introduced by Assemblyman Jim Patterson of Fresno, that would have prevented the California High-Speed Rail Authority from spending federal grant money on the bullet train while the courts continue to prohibit the state from borrowing money by selling Prop 1A bonds. Assemblyman Patterson noted that the state would be bound to matching any of the federal funding spent on the high-speed rail project. Aaron Fukuda, co-chairman of the CCHSRA, testified as a key witness in support of AB 1501. A second featured witness in support of AB 1501 was Diane Friend, Executive Director of the Kings County Farm Bureau. In addition, Alan Scott and Frank Oliveira of CCHSRA spoke during public comment in support of AB 1501, along with policy consultant and CCHSRA ally Kevin Dayton of Labor Issues Solutions, LLC. A California High-Speed Rail Authority representative claimed that Cap and Trade auction allowances (described by some as “taxes”) would match the federal funding. Representatives of the California Labor Federation, the State Building and Construction Trades Council of California, and individual construction trade unions spoke in opposition to AB 1501, along with representatives of high-speed rail interests. Assemblyman Patterson had hoped the committee would pass his bill to the Assembly Appropriations Committee in order to trigger a fiscal analysis. Instead, the Democrat majority on the committee rejected the bill on an 11-4 party-line vote. Watch the video of the AB 1501 hearing (starts at 20:50).